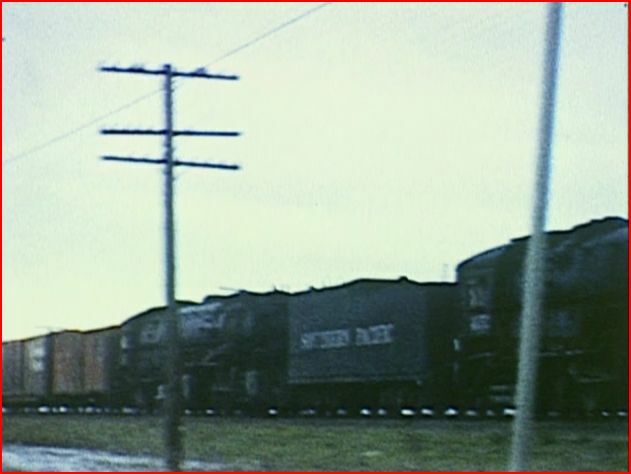 Sources: Southern Pacific RR, Louis Stein Jr, Othmar Tobisch, Will Whitakker (main sources) 10 additional including, Don Olsen and Max Gray. 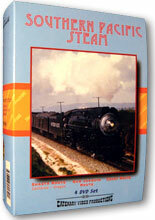 This program is available individually or as part of the Southern Pacific Steam boxset. 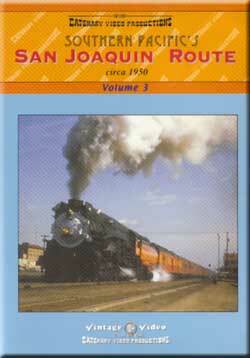 This volume covers Southern Pacific’s San Joaquin Route. The line services the Bay Area to Los Angeles. The 1950 time period is a fascinating one. The transition era of steam to diesel is a highly popular one for model railroaders. Variety of motive power does create opportunity for some superior trainwatching. The 3rd of a 4 volume series, the boxset includes a cardboard case to house the DVD’s. High quality factory pressed discs are used by Catenary Video Productions. Cinematography is the big strength of this program. Filmed in the 16mm format. About 99% color film. The films are clean and mostly of excellent quality. At least 14 film sources provide a wide assortment of viewpoints. 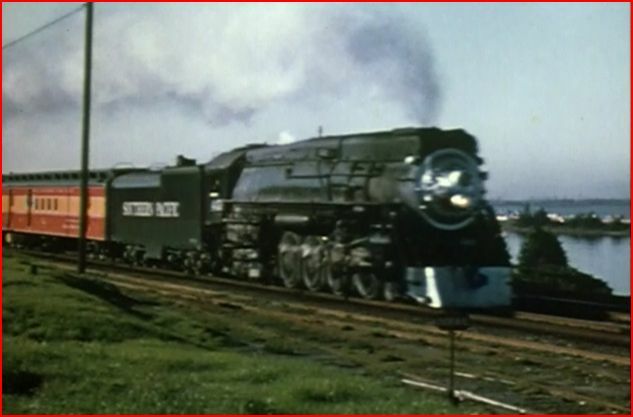 The Southern Pacific even shot film. 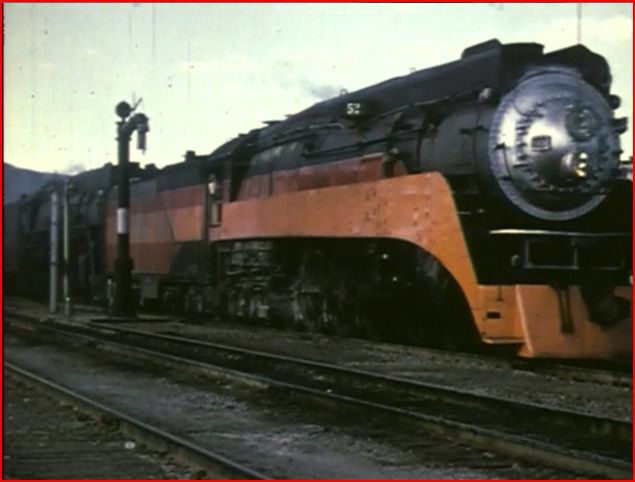 Some of the classic ‘This Is My Railroad- 1947 footage is here. Digitally restoration and enhancement have the films presented in best possible quality. Colorful show, and there is much to see! Scripted by Don Olsen. 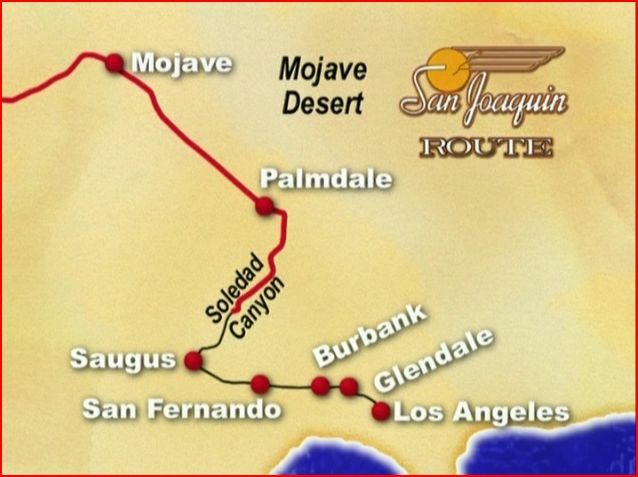 A very detailed overview of the San Joaquin Route. Motive power, name and numbered passenger trains are well covered. Tehachapi Loop gets extensive coverage. A look at the damage from a 1952 earthquake. Severe enough to close the line. 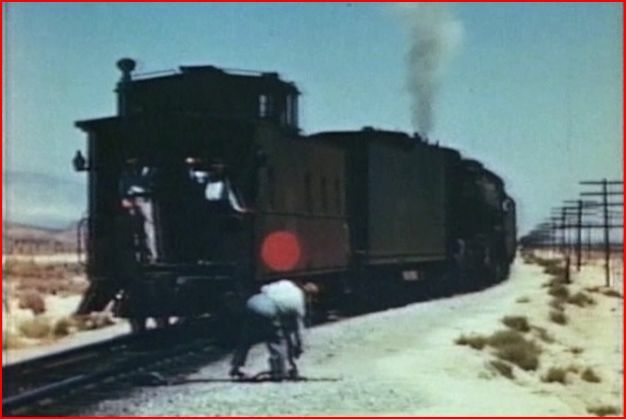 Audio is a mixture of: narration, soft jazz music and some dubbed train sounds. The train sounds are the least heard. They are used to ‘spice up’ the show, and rate as very good overall. 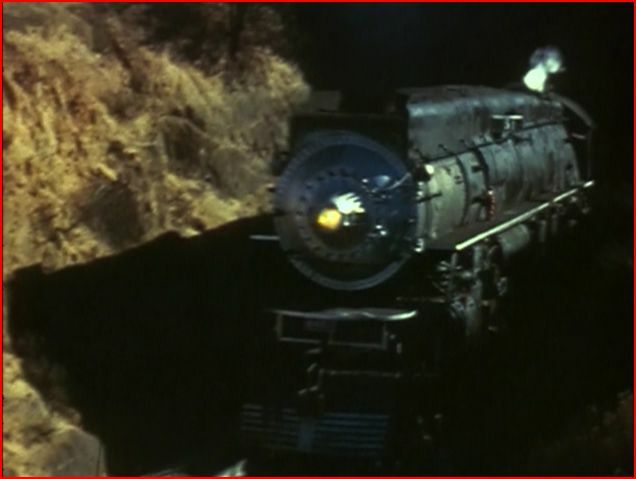 Sometimes, the narrator talks over the train sounds. There are some maps , which help direct the story. They get the job done. The journey begins at the northern end of the San Joaquin Route. 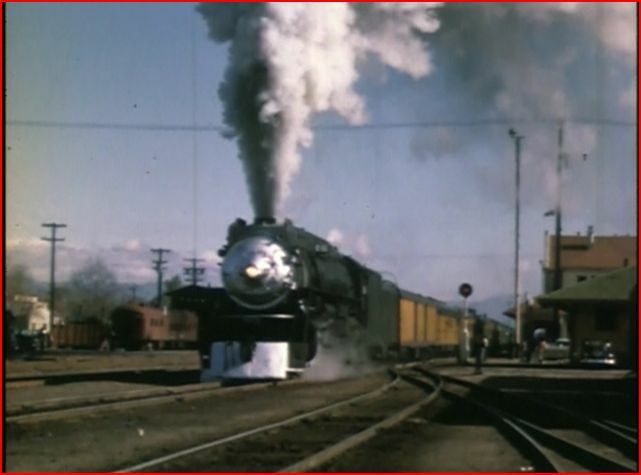 One scene at Martinez has this steamer meet some Alco PA’s at the station. This train is The Senator. 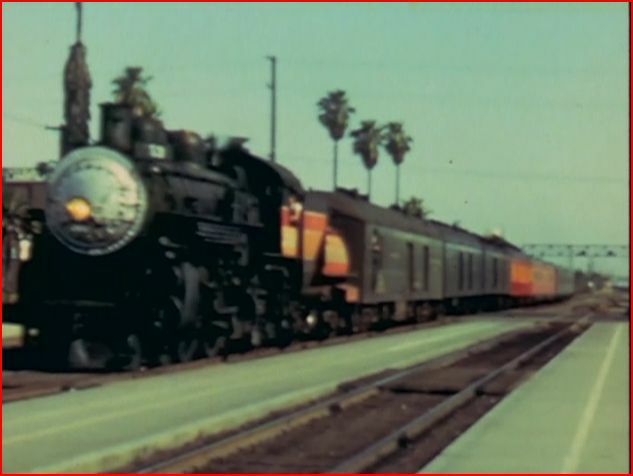 A consist of Union Pacific cars from The Overland, are led by #4460. 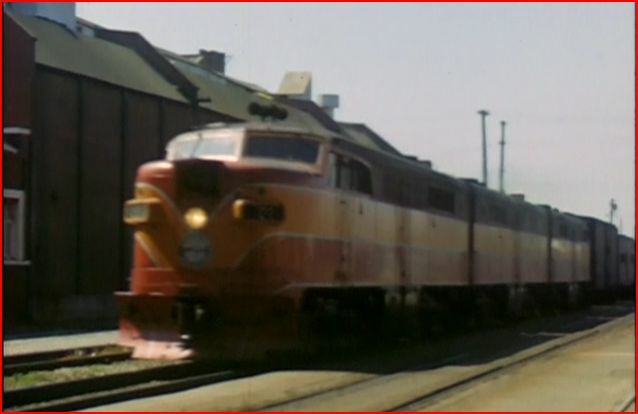 Departs Bakersfield station, as a 2nd, number 51 train. Flooding in 1952 caused some Union Pacific trains to detour via Tehachapi Loop. This locomotive has the caboose behind it for safety. 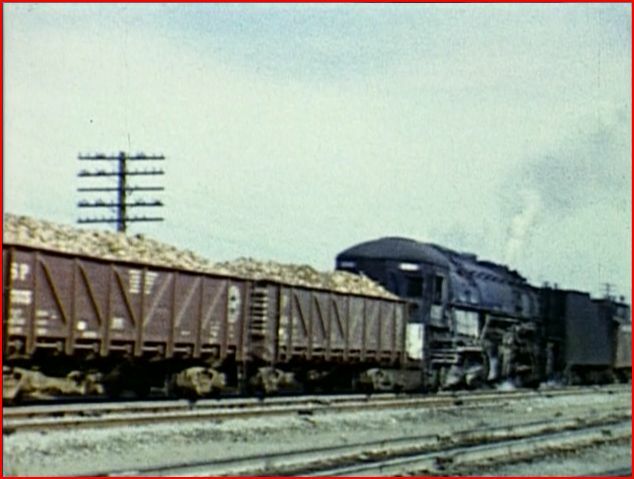 Sugar beets were big business for SP. This big AC-12 is in helper service on this move. Note the side extensions have not yet been added to the venerable gondolas that served for decades on SP. 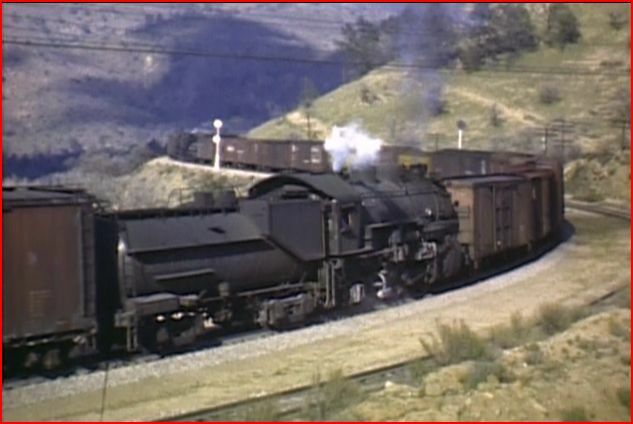 A rare pacing shot of two cab forwards shoving hard on a manifest freight traveling to Tehachapi. 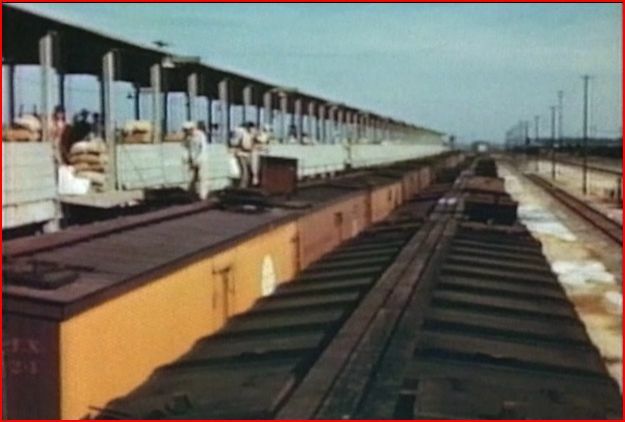 According to the narrative, this may not have been a railroad sanctioned practice! 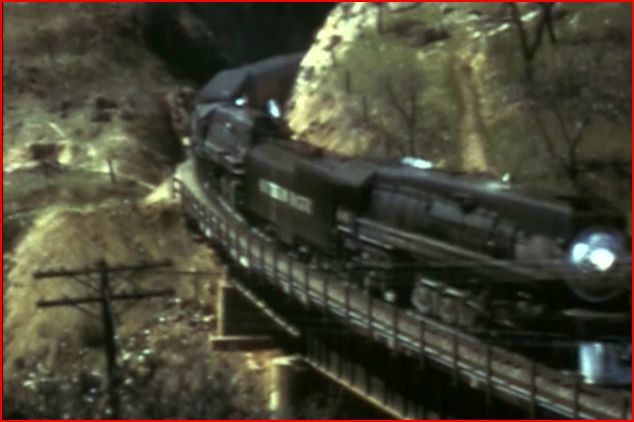 Two steam locomotives were required to get a passenger train over the Loop. Here they back-up to their consist. 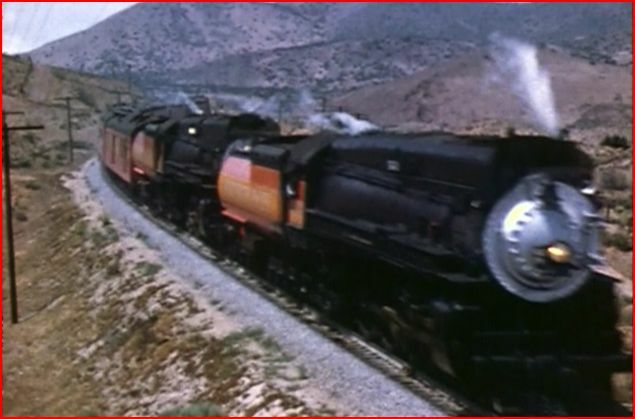 Action at Tehachapi Loop is the gem chapter, within Volume 3. Tehachapi Loop has a fascinating chapter. This is classic material! 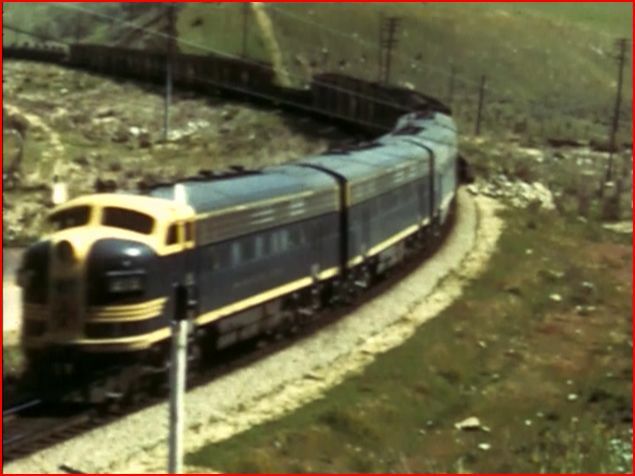 The 1950 era offers steam and diesels. 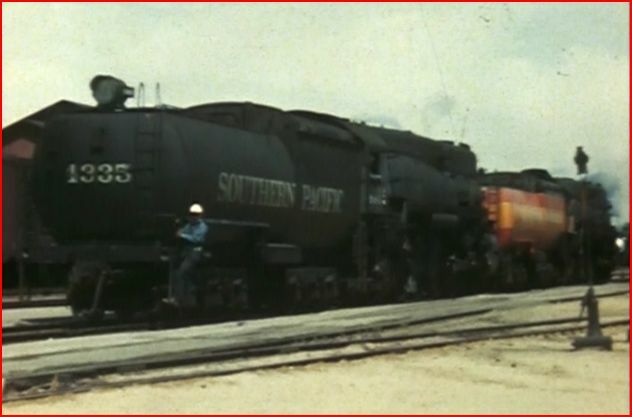 Both SP and ATSF are shown. A big 7.5 earthquake in 1952 occurred. Tehachapi Loop has an intriguing collection of films shown above. Passenger action abounds. Santa Fe found the F units more efficient there. Mid-train helpers were steam! There is plenty of freight. Many trains and a wide array of views. Visit this ice loading platform. 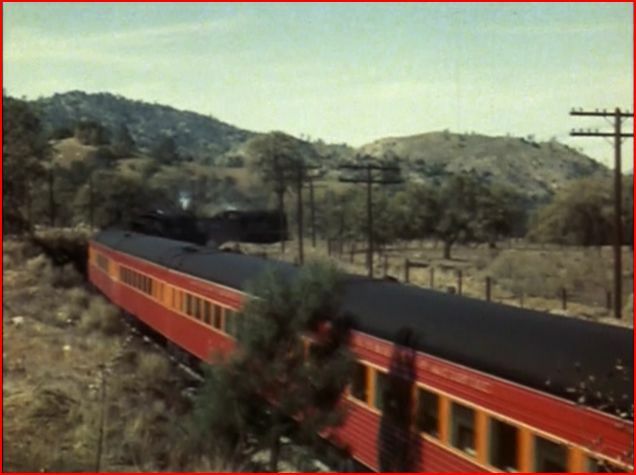 This scene at Mohave with train #52. 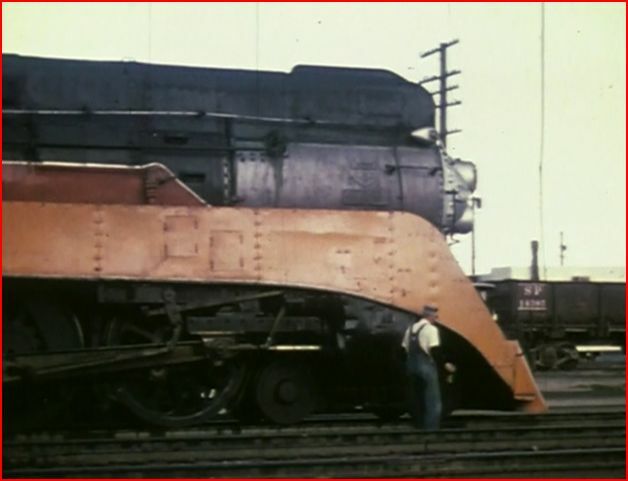 It shows a battered Daylight painted locomotive. This must be getting close to the end of the steam era. The engineer checks the running gear. Palmdale has this doubleheader, headed for Los Angeles. We need a caboose to end the screenshots. The crew waves, and we say goodbye! Catenary Video has come up big with this program. A great assembly of 16mm films. A detailed script, that has extensive coverage of the route. Operations are reviewed in depth. Not just trains: earthquake recovery, LCL freight, refrigerated shipping, and more. This show will stand up to repeated viewings. A fine choice for railfans and model railroaders. You may be better served to acquire the boxset. The four volumes are well worth owning. 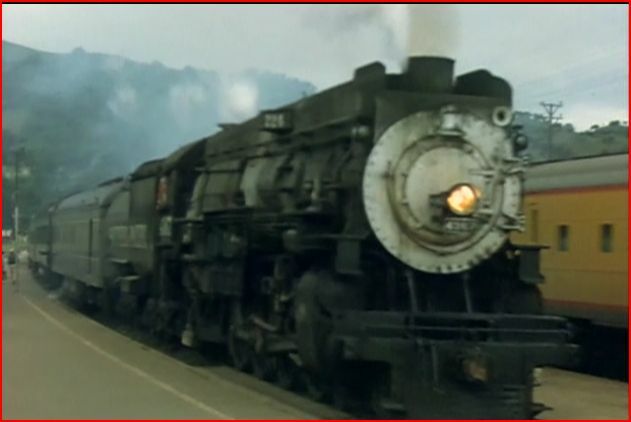 This entry was posted in ATVR Reviews, Catenary Video, Steam Train Reviews and tagged American Train Video Reviews, California, Railroad, Southern Pacific, steam train, tehachapi loop, Train DVD by William J. Hudson. Bookmark the permalink.